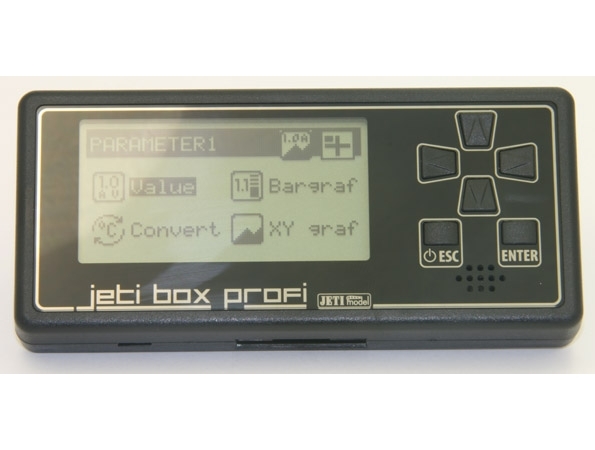 The JETIBOX profi is a mobile wireless device, offering maximum comfort to the user when viewing, processing and storing telemetric data. An integral part of the JETIBOXu profi is the system JETI DUPLEX 2.4GHz, which can be alternatively operated in one of the two offered wireless modes. 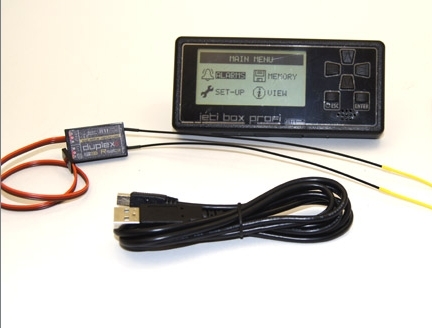 In mode Transmitter Module the JETIBOX profi can be operated with the transmitter as direct replacement of the exchangeable transmitter module. In mode Monitor the JETIBOX profi is processing telemetric data, which are sent between transmitter and receiver of the JETI DUPLEX system. The telemetric data received from the model can be displayed on the monitor and simultaneously stored in the internal memory for later analysis.